Destiny 2 - What is the Spicy Ramen Emote? Better get the Spicy Ramen emote in Destiny 2 before it’s gone. Today, Bungie held its second of three livestreams to discuss the Curse of Osiris. During this stream, Deej, community manager for Destiny 2, talked about the Spicy Ramen emote, commenting that it would soon be gone. This resulted in a spike of people wondering what this exotic emote is and how they can get it. 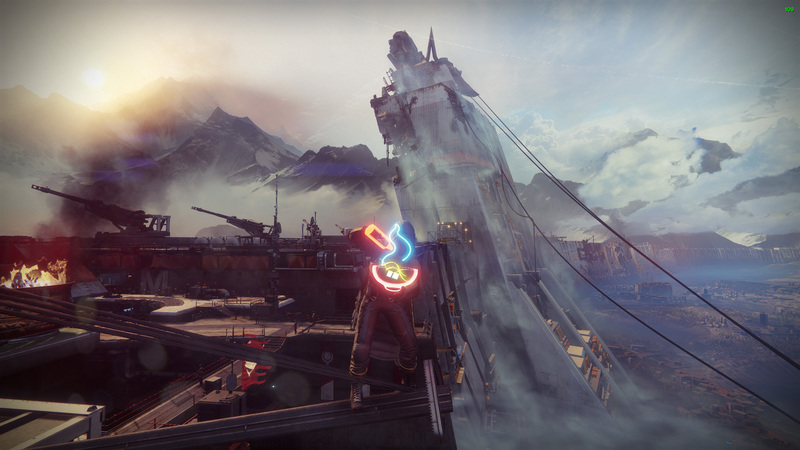 The Spicy Ramen emote is an exotic emote in Destiny 2. It can drop in a Bright Engram that you earn for leveling up, or it can be purchased directly from Tess Everis if she happens to be selling it. While the odds of it dropping in a Bright Engram aren’t great, Tess Everis is selling this exotic emote for the next week (November 21 to November 27). If you wish to buy it directly, it will cost you 3,250 Bright Dust. Bright Dust, as you may have already known, is a currency that you can get for dismantling some in-game items, such as ships and transmat effects. It can also come out of Bright Engrams. Besides getting one each time you level up, those can be bought with Silver, and silver can be bought with real money that you spend on microtransactions. What’s so special about the Spicy Ramen exotic emote? Nothing, really. I mean, Deej mentioned it on a stream and many Guardians likely didn’t know what he meant. The emote only shows a Guardian preparing a bowl of food, eating it and then tossing the bowl away. It’s cool enough, and I use it before each public event as a virtual carb load, but it’s no better or worse than other exotic emotes. 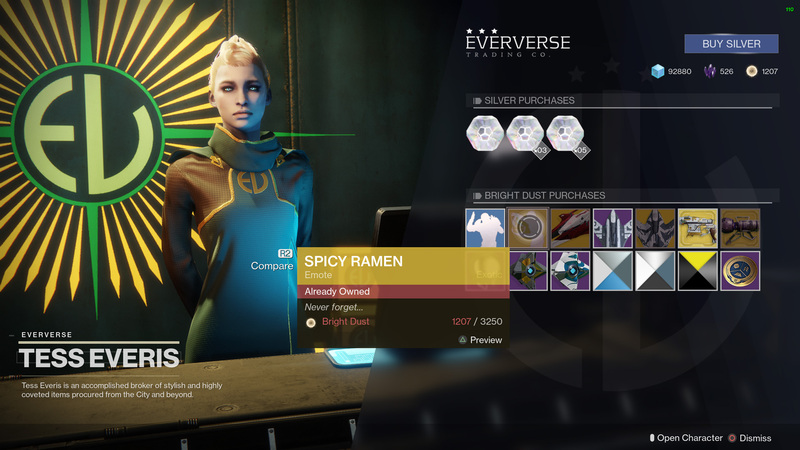 If it means that much to you, though, you’ll want to grab it soon; the Spicy Ramen exotic emote will be going away for good once the Curse of Osiris expansion launches. Now that you know what the Spicy Ramen exotic emote in Destiny 2 is, be sure to visit the Shacknews Destiny 2 complete strategy guide for everything an up and coming Guardian needs.